Nice work out there Sasha. Nice race, especially a week out from Ogden! 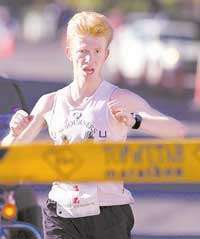 I ran that course when I was about 15 or 16 years old, but it used to be in September right before St. George. I always wanted to run Demetrio's 10k but he doesn't have it anymore. I know that they are pretty darn fast courses. This is a very good performance after Ogden a week before, probably close to your PR for the course. I'm amazed how you, Steve and I think, Bill Cobler too, can just turn around a week after a marathon and crank out fast 5Ks!